The Transparent Act (book) presents an artist’s intimate encounter of art by philosophising her practice whilst within the creative process. It explores the radical shift that technology has brought to the role of spectatorship and proposes how through the lens of human cognition we may achieve a better understanding of interactivity within art. The notion of Transparent Act synopsises multidisciplinary accounts and offers an experience-centered contribution to human-computer relationships and their aesthetics. Unlike retrospective accounts of art this book resonates the recent emerging practices of art as research and provides an inside-out viewpoint. This book is intended for practicing artists as well for theorists and curators to gain new perspectives of how interactive art may be practiced, presented, critiqued and engaged with. It includes number of illustrations of presented concepts developed by the author in collaboration with designer Imre Lepsényi. Inasmuch as anything has a traceable origin this book started life long before it was even thought of. And in a very real sense Brigitta Zics’ trajectory as an artist and theorist began long before her own engagement in the pioneering work of an earlier generation of artists and thinkers who looked at the landscape of emerging sound and image technologies in much the same way as previous generations of artists had looked at accelerated movement in space and time, the proliferation of identical objects falling from production lines, or the scale and spectacle of uncontrolled warfare. In short, Zics’ work and her thinking, was born into an artistic avant-garde that took the radical strategies and license of arts practice to the unresolved meaning of the world and in her case especially what we now call digital media. Her creative impulse was born and nurtured in media res so to speak and the particularity of her thinking marks a very special moment in the development of the audio visual arts as the baton of pioneers such as Peter Weibel, and Miklos Peternak, was poised to be handed to the next generation. Zics took up the race as the secessionist momentum that begun it was in danger of running out of steam. This book, THE TRANSPARENT ACT, Transparency, Cognition and Interactivity: Toward a New Aesthetics of Interactive Media Art, Zics’ installations and constructions such as Mirror_Space and the Eye Resonator ( and the earlier version of this installation the Mind Cupola) are remarkable, and indeed important, because, unlike many who picked up the baton that was (breathlessly) offered, she has taken it in directions that were not anticipated by those pioneers. What follows in this book represents both the kind of continuity and rupture that has always marked the ambitions of a thoughtful avant-garde. ZICS, B. 2014 . 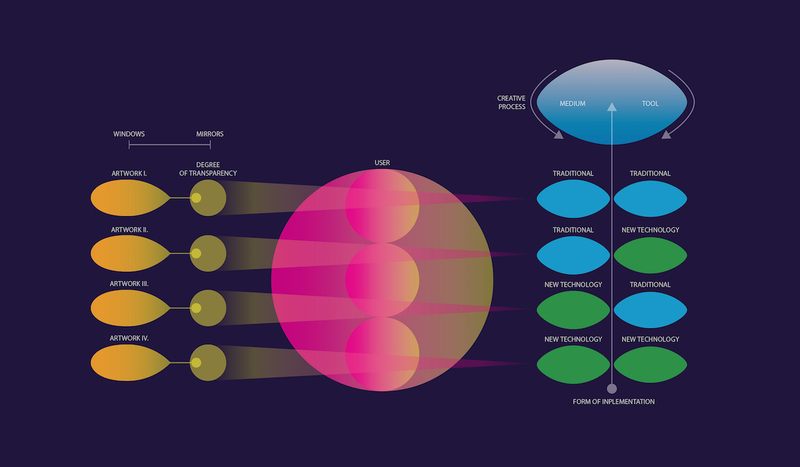 Infographic IV: Degree of transparency as the outcome of the flow production by the applications of invisible tool, degree of openness and responsiveness. [Illustration]. ZICS, B. 2014 . 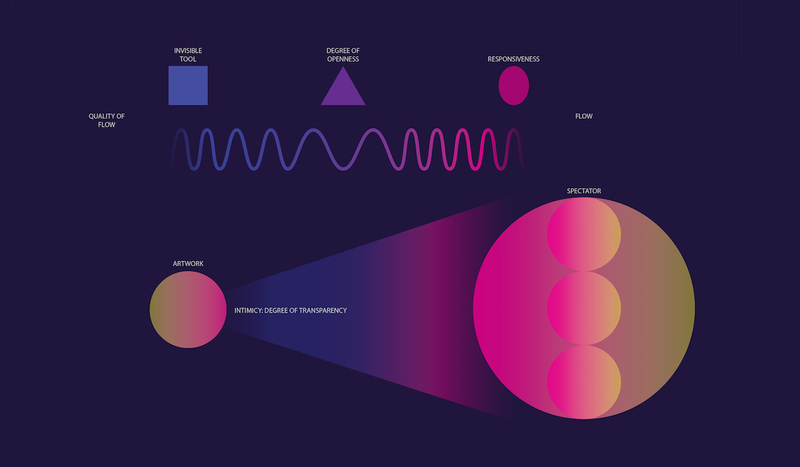 Infographic III: The matrix of artworks based on their qualities in medium and tool. [Illustration].